Antiques challenge. 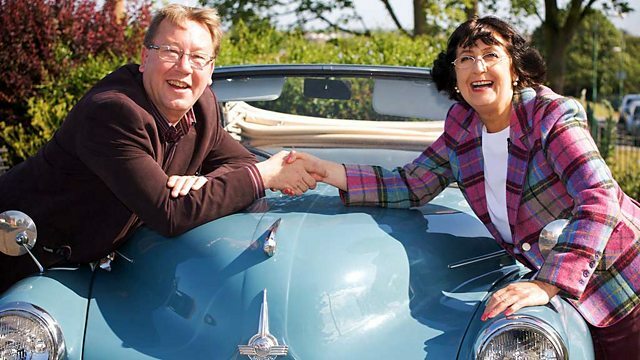 It is the penultimate leg for antique hunters Anita Manning and David Harper as they start in Northumberland, England, and cross the border into Scotland. The aim? To make the biggest profit at auction. But it is no mean feat. David Harper and wily Anita Manning. Oh, Anita, does it get any more beautiful than this? Seriously! It becomes more and more beautiful the farther north you go. Listen, we are not in Scotland yet. This is Northumberland. of antiquing behind her, but she still has got a spring in her step. -My first boyfriend used to sing that to me. I hope he's not watching. expertise not just in antiques but fashion prowess to Anita. If it is really cheap, I'll buy it for her. It is 40 quid. She is not worth 40 quid. in their beloved Morris Minor. reasonably fashionable with your yellow trousers, again. but we do look a bit like a bunch of bananas. in the competition with just over £10 between them. They started the trip with £200 each. but he is still in the overall lead with £422.60 to spend today. if I see a chance of profit. -Would you do the same? -I'm a bit more canny than you are. -But I like your style, sir. Apparently so, as you appear to have borrowed a pair of his trousers. and the town of Paisley. Today's journey commences in Powburn, in Northumberland. Here we are, David, Antiques Tea Room & Emporium. -Coffees and teas all around. -Life couldn't get any better. Well, it couldn't. Not with you, Anita. Not with you around. in Powburn, shopping at two neighbouring establishments. If you need any help, David, give me a shout. OK, pop a kettle on. He is visiting Hedgeley Antiques Centre. it doesn't take him long to find something right up his street. It is a wooden writing slope. South Chinese, Cantonese, probably during our Victorian period. Very symbolic. There we have, right on the front, chickens. The most important creature is the cockerel. and he represents strength, vitality, masculinity. Everything that is strong and powerful about the male. It folds down, no doubt. Satinwood finish to the interior. Black velvet, which is probably original. Is it absolute stonker. Yeah, don't we all? It's ticket price is £95. Is Jane prepared to do a deal? I'm going to talk to you about this dreadful Chinese writing slope. -What could it be? I would love to pay 30. I don't think so. I think we need a little bit more than that. -How much is a bit more than 30? Can we do somewhere in the middle, 45? -I could not say no to that. Cor, David was quick off the mark there. and has also found a couple of items she is keen on. Dealer Beryl is on hand to assist. ..are the perfect accompaniments to the Antiques Road Trip. and have a lovely picnic. where we could have a dance. -He'd see a big difference. That was wonderful. But you are better looking than David Harper. I think that is a compliment. But is she actually going to buy anything? The gramophone is £55 and the picnic set, 38. The picnic set isn't of the finest quality. We don't have the container for the champagne. Wind-up gramophones are always great fun. I'm going to have another look around, but I might just go for them. Not quite ready to commit, Anita carries on browsing. David, meanwhile, has found another interesting object. maybe 1930s, even '40s, ashtray. What I am interested in is actually what is underneath the glass base. And it is described as a glass and jade ashtray. it is incredibly difficult to carve. lavender, red, yellow, black and white. It is priced at £6.50. So another one to think about. Now back with Anita. What's she up to now? Sight going? I've come outside to have a closer look at this wee posy holder. It was in a cabinet. coming out of these funnels here. Now, it's priced at ten pounds. at ten pounds, it is a bargain! A hallmark would mean it is silver and therefore more valuable. This could be a real find. and the gramophone. But is Beryl The Peril willing to negotiate? Now, if I am buying three things, I was wondering if I could have a deal. Their combined ticket price is £103. is between £45 and £55. -I think I am fine. And I love the items. 20 for the picnic set and ten for the silver flower holder. -Shall I include that Road To Dundee for you? -You can play that at the auction. -I can kid on it was one of my old boyfriend's. One of my biggest weaknesses in life is cars. dates way back to the early days of the car. which did a bit of a bomber. Oh, yes. That was their first auction. To tell you the truth, I'm surprised they went that far. it will certainly fall into that category. She will hate this with a passion, which makes me love it even more. made for a vintage car, early 20th century. I don't know, probably Edwardian. original little rubber squeezer, whatever you call it. It feels really dry. And brittle. Perhaps because it is priced at just ten pounds. -We have an ashtray with a bit of old jade. -And a bit of old iron/brass. -Once part of a vintage car. I want them both very desperately. That's right, David, keep your cards close to your chest. The combined ticket price of the two items is £16.50. -Well, what about rounding it to 15? Three things on my account very quickly! with the Chinese writing box, to £60. rule until eventually falling under the control of England in 1482. It's great walls were originally created to keep out invading Scots. and museum of the King's Own Scottish Borderers. I can't wait to get inside and for you to show me around. on with nothing but their pipes into hundreds of bloody battles. involved in all major conflicts since that time. Yes, ever since, really, the Battle of Killiecrankie. And then the Boer War. And indeed, Afghanistan of late. -So it is still a major force. a major part in this regiment. What did the piper do? Why was the piper there? On through history, there were pipers. What were they there for? Well, they certainly made you get up and go. than the sound of the pipes. Their music was like a war cry, rallying the troops into battle. It served to boost morale but also to intimidate the enemy. There are stories of Germans saying, you know, "What is it? -Is that what they were called? "I'm putting my hands up." to be in the front line, where they could be picked off very easily. medics in the wider sense of the word. endure was at the start of the 20th century. What would it have been like to be a piper in the First World War? I think it must've been terrifying. and you are an easy target. I don't how they did it. the weaponless pipers would lead the charge into the battle. not helped by the introduction of poisonous gas. -There would have been fire, open fire going on. "Oh, there is the piper." while the others, in the trenches, probably kept theirs on. over 100 of the most revered medals during the First World War. the troops were hanging back from going over the top. In spite of the dangers, Laidlaw was ordered out of the trenches. "For God's sake, Laidlaw, pipe them forward!" took his gas mask off and started playing. And he started playing a regimental march, Blue Bonnets Over The Border. And the jocks were stirred. Something said inside them, "I'm going over." became known as the Piper of Loos. and was to be awarded the Victoria Cross that day. and he was also promoted from piper to corporal. Army piper to lead British troops into battle in 1945.
by the King's Own Scottish Borderers. over £360 left to spend and is visiting Berwick Antique Centre. -Dave, nice to meet you. What a day, what a place. -Right, we have a cafe. If you spend more than ten pound, you get a free cup of coffee. Not that David ever needs any encouragement to spend. you can hear it - it just creaks. It is like being on an old boat. It has got such an atmosphere. These are the kind of places that you could find...anything. See, I absolutely love that. Have you any idea what you think this could be? Fantastically detailed. It is obviously Oriental. Is made mainly for a female, even though it is very heavy. The bronze would be highly polished, and that is your reflective mirror. but historically, they were rare and expensive commodities. And the bronze mirror is not the only thing to catch David's eye. So what have we got there? We have got a mahogany Georgian-style chair. I love the tapestry seat. I don't think, but it has got age. But is it actually a Georgian chair? So we have the hand-cut, rounded blocks that keep the chair together. in about 1770 from solid mahogany. I have got to buy that chair. That would be dealer Stephen's cue. I priced it because I wasn't sure about it. probably worth more than £25, but I'll do it for 20. Well, and I obviously get a massive cup of coffee. -You could have a mug. -Do I get a bit of cake as well? Thank you very much, Steve, you are a delight. Pushing your luck a bit there, David. And there is still one more item to discuss. is two old ladies that have lived in this house for about 100 years. So that is its provenance. and I totally believe it. Its ticket price is £140. Much more than David would like to pay. To stand a chance of it taking off. £70 and I can do a deal. Let's see if the polishes up all right. And if it does, I'll have it for 60, how is that? Time for a bit of spit and polish. in a Japanese bronze geisha girl's mirror? -That would be a first. -It wasn't a mirror before. -I think you got a bargain. Now it is a mirror. and got his free cake and coffee. adventure for our daring duo. It is a new day and a whole new country. We think. Anita, I think you'd better announce where we are. I think we might be in Scotland now. Well, come on, show a bit of enthusiasm! We have been working our way up here. I thought you'd be absolutely celebrating and going wild. but there are no border patrols. Lucky for you, because those outfits are just criminal. In spite of Anita's confusion, we have indeed crossed the border. Yesterday, in England... Nice hat, Anita! with record, a vintage picnic set and a silver flower holder. Today, she has just under £350 left to spend. a George III mahogany chair and a Japanese bronze hand mirror. He has just over £280 left to spend today. John Duns Scotus, from whom the word dunce was derived. Catholic beliefs and old-fashioned theories was simply foolish. A little antique centre, both of us together. -Don't be following me about. David and Anita are sharing the shop floor this morning. David, you go that way. -As far as I can. -As far as you can go. Right, well, I am pretty safe, really. I've got five cracking objects. to add to one of my lots to make it much more appealing and desirable. Anita, meanwhile, only has three lots. But there is something that has already piqued her interest. This is rather a nice, sweet thing. It is a wee treen stuff box. But what makes it special is the horseshoe motif. Across the shop, David is buttering up dealer John. -Now, listen, I've got a bit of a cunning plan here. -I've got this lovely Chinese writing box. -It doesn't have any inkwells in it. I might be looking for something like an inkwell. Just something to lash it up a little. or inkwell if you like. -Right, David, just come through. -This is the one I was thinking of. -That is a nice little one. He doesn't just chat up the birds, he chats up the guys as well. Listen, honestly, take no notice of her, John. -How are you doing, darling? Well, I was doing all right until you said something. Anyway, back to the inkwell. Its ticket price is eight pounds. How much is it to me? Is it a pound or two? but we could do four with that? He is a right charmer. -It's getting better! It's getting better! I'll just pause a bit longer. Buy something for three pounds. Do you know what, can't say no to that. Thank you very much. leaving John free to give his full attention to Anita. -There is a wee snuffbox in here. -Oh, yeah, that is lovely, that. -It is like a hardwood, almost a rosewood. -and your little whip there. -I think that is quite nice. -I'm sure I could do something. -I am used to these Glaswegian persuasive powers. -My wife is from Glasgow. Wise man. Its ticket price is £45. I am looking for in the region of kind of 18...£18. Oooh, 18. I don't know if I could do 18. -Could you come to 20? -I think we could, yes. -Yes, to give you help. -I like that. It is a nice, sweet thing. -Nice, sweet thing. All we need is a snuff-taking horseman. And that is Anita's fourth item done and dusted. a seaside town on the southeast coast of Scotland. environmental movement - world renowned conservationist John Muir. his childhood pursuits here in the 1840s. and beautiful countryside inspired his passion in nature. museum officer of John Muir's Birthplace. My gosh, what a view! This is perfect for exploring John Muir's playground. He spent the first ten years of his life in Dunbar. environment would also stimulate an amazing imagination? would talk about the birds' nests that they could find. who knew the most nests. but also helped to educate him. His grandfather taught him his letters and numbers. and letters, before he went off to school at the age of three. where he was forced to work on the family farm. John was set to the plough. His life was hard work and labour. But he still had this passion to learn. believed the only book you should have in the house was the Bible. he had an accident that was to change the course of his life. he had been focusing on. by the wildest, leafiest route that he could find. the Sierra Nevada and Yosemite and became devoted to protecting it. His ability to see how everything in the universe is hitched together. you would then have problems with soil stability. further downstream, which would have a knock-on effect elsewhere. -Somebody way ahead of his time. John became famous in the States through his writing. pushing for National Park status for Yosemite. And that same year, it was granted. become as passionate about wild places as he was. of which he was president for life. requesting a camping trip in Yosemite. John and the president set out on a camping trip with no other support. today of a presidential visit. that was needed for Yosemite National Park. -Quite a seal of approval there. Roosevelt went on to pass afforded Yosemite even greater protection. National parks now exist all over the world, with 15 in the UK. came perhaps the greatest pioneering conservationist of modern times. where Mary Queen of Scots resided in 1566.
and is meeting dealer Mary in Bygone Days Antiques. The sun is shining, so why are you eyeing up some snowshoes, old girl? I can't stop looking at these snowshoes. Because they are so quirky. They are so quirky. -A wee bit of damage on them. And old attached ticket says "Snowshoe Club, Montreal, 1889." Is it something that sells well? -Have you had them for a wee while? -Would you like to look at them? It is certainly a change from Anita's normal choice of jewellery. It is beginning to be tempting. They're a wee bit quirky. That's why I'm drawn to them. And who knows the price of them? Mary, probably. Ticket price is £100. -Could I make you a daft offer? -Oh, you can try me. Could these be bought for £25? Is Mary going to throw her out of the shop? -Are you going to go for it? Mary is obviously feeling generous. Anita is now the proud owner of a pair of the Victorian snowshoes. silver flower holder and treen snuffbox. a George III mahogany chair, and a Japanese bronze mirror. If you say so, David. It is the end of another shopping spree. But what are their thoughts? is probably going to come from the old silver epergne. she is going to make some money. So that type of item isn't great in this market. some people call it jade - that might attract people to it. It is that all-important auction day. David will be missing today's auction. David isn't with us today. but not too much as I want to win. and our auctioneer today is Struan Robinson. The vintage picnic set. I think this is really nice. It's complete. You could take it straight out, have a picnic with it if you wanted. I think that is my favourite. I think that might make the highest out of the lot today. in this competition, so there is everything to play for today. First up, it is Anita's gramophone with record. Now, this is a really nice piece here. you can go straight out into the grass and have a wee listen. OK? And if you really want, OK, take Jamie with it. listening to your music, OK? -He started at 30, that's good. Advance on 50? 55. 60. Advance on 60? Advance on £60? All out on 60, then. That is good, £60. I'm happy with that. That's the sweet, sweet sound of a profit. Bravo, Anita. Next, it is David's 20th-century brass car horn. -£15. Ten pounds, not dropping. Come on, ten pounds. He is in profit already. Advance on 10? 12. 14. 16. 18. Advance on 18? Still cheap, guys. All out on 18, then. £18, that is not bad. I am sure David would be pleased. Not sure he will be. But he has doubled his money there. Will Anita's vintage picnic set fair any better, though? what a lovely wee accompaniment. OK? And again, you'll have Jamie with you. OK? So you have got all that there, OK? 32. £32. Advance on 32? £36. Advance on 36? Still cheap. 38. £38. 40. Advance on 40? Next is 5. Advanced on 45? 50. Advance on 50? Advance on £50? Advance on 50? Keep that open there, Jamie. Keep enticing her. Advance on 50? Advance on £50? Jamie is worth it. All out on 50 then. £50, that is not bad. It is no picnic making profits at auction. That is another good buy for Anita, though. David's George III mahogany chair. And I'll start the bidding off at 30. Advance on 30? -Advance on 30? Advance on £30? All right on 30 then. Last chance at 30. Maiden bid at 30. That is not too bad at all. Who says brown furniture is not that popular at the moment? Cos that is actually quite a decent profit. though, was Anita's silver flower holder. That is my best item and I am really interested to see how far it will go. I am hoping for great things on this little one. And I'll start the bidding off at 80. At 80. Advance on 110? Advance on £110? All out on 110, then. Advance on 130? Advance on £130? Advance on 140? Advance on £140? All out at 140, then. Yes! That's an amazing profit and a great find. Well done, Anita. Lesson there - look for the hallmarks. They can be underneath a piece of embossed work. Will David's jade based ashtray do as well? He paid very little for it. It is going to do well. Ten, I'm not dropping. Come on, guys. It has got to be worth that. -Ten bid. An advance on ten? -Advance on ten? 12. £12. 14. 14. Advance on 14? Advance on £14? All out on 14, then. £14. Well, it's still profit. Another small profit there. David needs a big win to catch up. Next, it is Anita's treen snuffbox. -25 starts it then. 25 bid. Advance on £34? All out on 34, then. I am happy enough with that. £34. That was probably just about the right price for it. If you are happy, then I am happy too, Anita. I am soaring ahead at the moment. But David has his two best items to go. Speaking of which, it is David's writing box with the inkwell. 65. 70. £70. Advance on 70? Advance on £70? All out on 70, then. Not bad indeed. David will be sad to be missing the excitement. -I'll start the bidding off than at £20. Advance on 20? 22. 24. 26. -There is a wee bit of interest in there. £34. An advance on 34? Advance on £34? Still cheap, guys. All out on 34, then. That is good enough, I am happy with that. Anita is having a great day today. his Japanese bronze mirror - is up next. Stand by. This could be a flyer. £30, then. Come on. £30, guys. 30 bid. Advance on 30? 32. 34. 36. 38. 40. 45. Advance on 45? 50. -Advance on 50? Advance on £50? Advance on 50? All out on 50, then? Oh, £50. Didn't quite make it. In fact, you could call it a sad reflection. He'd be disappointed with that. Better luck next time. Onwards and upwards. David started today with £422.60. He has made a small profit of £7.24 after auction costs. Anita, however, has had a great auction today. the lead from David with £565.25 to spend on their final adventure. and I am absolutely delighted. but he has still got a healthy budget going forward. Safe home, Anita. And hurry back, David! Anita takes a titanic-sized risk. But who will come out victorious? Don't sell them. Oh, no! It's the penultimate leg for antique hunters Anita Manning and David Harper. Starting in Northumberland, England, and crossing the border into Scotland, they search for hidden gems before heading to auction in Kinbuck, Stirlingshire.